The Contemporary textiles Fair at the Landmark Arts Centre, Teddington was fantastic this year! My work was very well received. The position of my stand meant that the power of the colour in my work stopped people in their tracks! Sales were up and I had some amazing conversations with both the other stand holders and the visitors. As a result of the Landmark Arts event I have been invited to be involved in an exhibit at The Baltic Centre for Contemporary Art in Gateshead as part of the Great Exhibition in the North. The surface that I created to make my latest bag collection was spotted as a potential surface for a triangle in a geodesic dome structure to be displayed in 'Future Thinkers', and exhibition by Ryder Architecture. 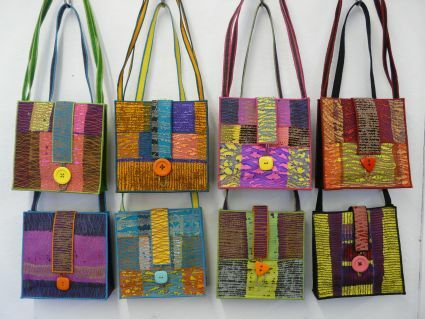 Each bag is 18 cm square and made up of various pieces of layered fabrics which I have then free machine embroidered and textured with a heat gun. Full of excitement at the prospect of a new challenge I downloaded the requirements for a triangle for the geodesic dome.....measurement around 1.4 metre to be delivered by the last week in April! I could have said 'No' but 'What an Opportunity' is still ringing in my ears. So I have been stitching like mad, creating large pieces to cut up and reassemble. I will post an up date when I can be prized from my sewing machine! Please follow my blog to see what happens next and hopefully I will have the whole story to tell by the time I have my stand at Hope Valley Fringe, in Hathersage on Saturday 28th April.